Now it's time to dive back into Christmas cards and today I've combined the little sitting girl from the Roberto's Rascals 3 Reindeer set with Little Elf for this one. I love how these two stamps interact with each other, doesn't it look like he just adores her? I found this pre-made scene in the Doodlebug Milk and Cookies paper pad so I fussy cut them out and plunked them right into the cozy living room. I imagine them being all dressed up for the yearly Christmas pageant, waiting to do their rendition of "Here Comes Santa Claus". Alrighty then, be careful if you are out there doing the crazy Black Friday shopping today and I shall see ya back here on Monday! They are adorable. The background paper looks dimensional. Hugs. 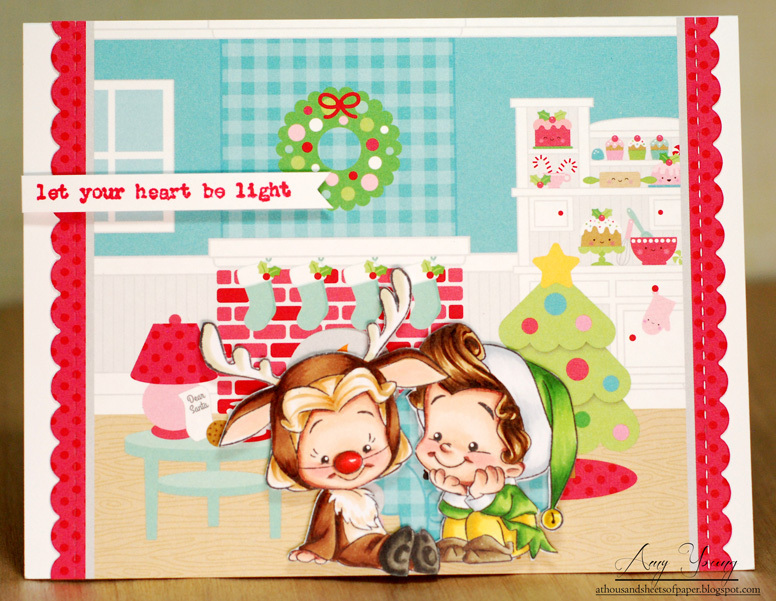 Oh my goodness these are super cute and those papers are sooo Perfect for these cuties!!! !